The check format is the following: NEBS/DELUXE part # DLT104 at www.deluxe.com. If you order a different check, make sure the format is the same or it will not print correctly. Intuit checks also will work. Go to Back Office - Accounts Payable - Accounts Payable Processing for most of the procedures. Go to Back Office - Accounts Payable - Accounts Payable Processing - Enter/ change invoice. Vendor code - Enter the five-digit vendor code or type L to look up. Invoice number - Enter the invoice number, up to 14 characters. If you do not have an invoice you can create any alphanumeric invoice such as 080117B. Discount amount - Do not enter anything in this field. If you are set up for "global" discounts, this will populate based on the parameters you set up. See Discounts in A/P Setup . See Discounts Processing. General ledger date - Enter the date you want this to post to General Ledger. For example, if this is an expense you want go post in July 2017, you might type 073117. Invoice date - Enter the date of the invoice. You will have the option of printing the Ageing/Cash Requirements report by invoice date. Due date - Enter the due date. You will have the option of printing the Ageing/Cash Requirements report by due date. Comment - Enter an optional comment. Default is the Vendor name. Pay code - When you get to this field, the following will pop up. Type P if you are going to pay this invoice now or if you would like to put this in the queue for the next check run. Enter H to hold this invoice, and exclude it from the queue (if paying by due date). Type C to clear an existing code. Type 9 to make this invoice paid. You should enter 9 in this field when making corrections or when applying credit invoices to debit invoices; otherwise you will be out of balance. See Making Corrections. If you are unsure, please contact Execu/Tech before you do this. After you enter the payment code, you will move to the next part of the screen, where you will enter the invoice distribution to the GL accounts. G/L account will be the account that will be debited by this invoice (unless you are creating a credit invoice). Typically it will be an expense or liability account but consult your accountant if you are unsure. You may enter as many G/L Accounts as appropriate for this invoice. Amount will be the amount to apply to each G/L account. As you enter the amount, notice the "not distributed" amount. You will not be able to complete this invoice until that figure is zero (0.00). When the amount not distributed is zero (0.00) the cursor will go to the bottom, where you will press Enter to save the invoice. 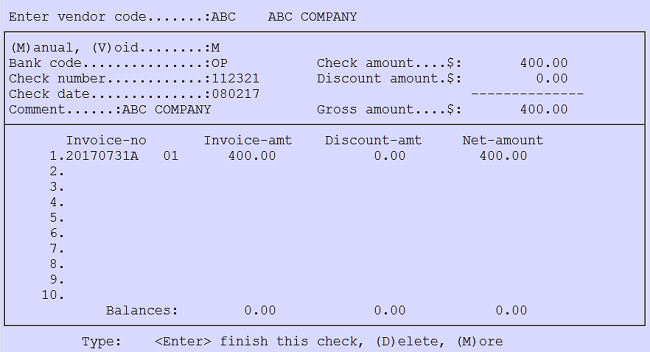 To look up an existing invoice, type L in the "Invoice number" field and press Enter. You can then display unpaid invoices only or all invoices. You can enter the beginning date to display or press Enter to display all dates. The invoices for this vendor will display. NOTE: Do not delete an invoice after the batch has been updated. Otherwise the vendor totals in Accounts Payable will be out of balance with the Accounts Payable sum in general ledger. If you wish, you can print checks by due date rather than selecting invoices for payment. 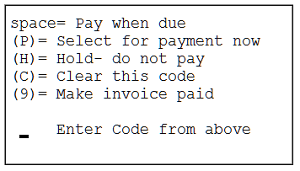 If that is what you wish to do, do not select invoices for payment; invoices should have a blank pay code if you're going to print checks by date. To see what is due, you can print an A/P Vendor ageing/cash requirements report. You can age the report to the past, to see what is due or past due, or you can age the report forward to see what is due in the future. If you just want to see a list of invoices, you can leave the ageing date fields blank. There are two ways to select invoices for payment. One way is to bring up each invoice you wish to pay and enter P in the pay code field. The other way is to run "Select invoices for payment" from the menu. This will being up each unpaid invoice for each vendor selected. You are now ready to print that invoice. This is a quick way to select one invoice for payment. If you need to select several invoices, Method 2 will be quicker. Go to Back Office - Accounts Payable - Accounts Payable Processing - Select invoices for payment. Enter the vendor code. Each unpaid invoice list, one at a time. Select "Set pay code to 'P' (pay now)". The next invoice for this vendor will show. To make a partial payment, enter the amount to pay NOW at the prompt, as show below. A new invoice will be created for the remaining amount. 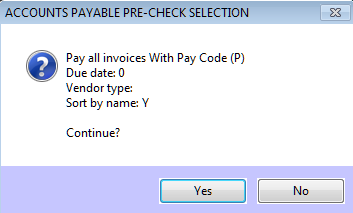 When all invoices for a vendor have shown, a popup will let you know that's all for that vendor. You can then continue with the next vendor or press Esc on your keyboard to exit. 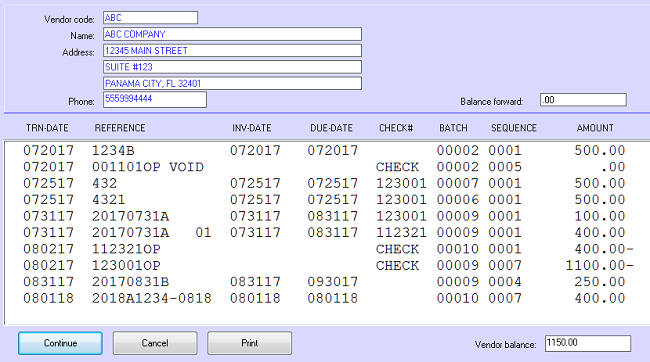 After you have selected invoices for payment, you must print the Check Edit report. Checks will not print until you do this step. Before printing checks, you must go to Print Check Edit. This is what puts the selected invoices in the queue. Checks will not print if you skip this step. Go to Back Office - Accounts Payable - Print Check Edit. 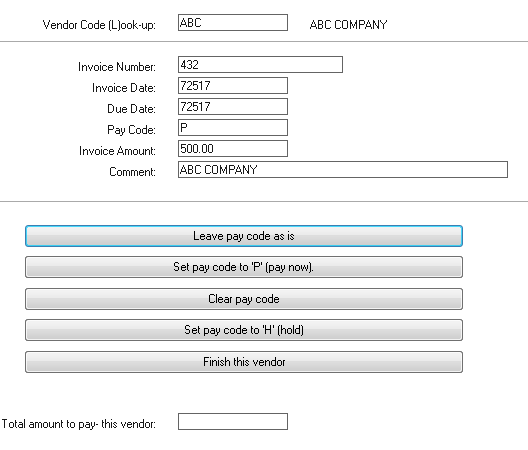 If you selected invoices for payment, you will select #1, "With Pay Code (P)". 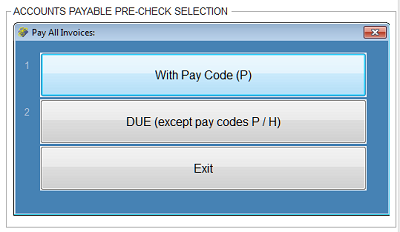 If you are going to print checks by invoice due date, then select #2, "DUE except pay codes P / H". If you are paying by due date, all invoices with a blank "pay code" will print if the due date is on or prior to the date you enter. Invoices with a later due date will not be included. Answer each prompt as appropriate. The pre-check edit report will show all invoices to be paid for each vendor and the vendor totals as well as the grand total (bank total). 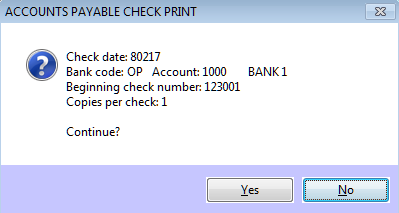 After you have printed the Pre-check edit, you can print checks. NOTE: If someone else prints checks after you have run "Print check edit", your checks will print as well since they have already been queued. If someone else wants to process checks after your pre-check edit, you will need to clear each invoice's pay code and the other person should then print a pre-check edit. To avoid this extra work, do not print the pre-check edit until you are ready to print checks. Go to Back Office - Accounts Payable - Print Checks. Answer the prompts as appropriate. 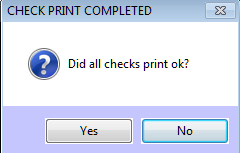 Do not answer Yes to "Did all checks print ok?" until they have all finished printing and you have checked them. If they did not print correctly - for example they were put in the printer upside down - you can answer No and just start over. If you answered Yes and have to start over, you will have to void all of the checks, reselect the invoices for payment, reprint the Check Edit, and then reprint the checks. It's much easier to look at the checks before answering Yes. The check itself will be at the top of the three-part check. The middle is the vendor attachment. The bottom third is your copy of the attachment. The attachment shows the invoices being paid by this check. If you are paying more than five invoices, they will not fit on the attachment. In that case, you will print the attachments on blank paper. Only checks with nothing on the three-part attachment will print a separate attachment when you run "Print Check Attachments". You can enter manual checks if you do not want to print checks. Remember to update your batch. Make sure to answer NO to "Post TOTALS only to Accounts Payable Control Account?" If you answer Yes to "Post TOTALS only to Accounts Payable Control Account?" only summary totals will post to the A/P control account. Make sure to save this report, as the A/P detail will not be in General Ledger for these transactions. You can enter a wire transfer, enter a manual check, etc. You also can void a check. Go to Back Office - Accounts Payable - Accounts Payable Processing - Enter manual / void checks. Vendor code - Enter the code for this vendor or type L to look up. (M)annual, (V)oid - Type M to post a manual check. Bank code - Enter the bank code, such as OP or BA, as set up in the A/P Control Record. Check number - Enter the check number. Check date - Enter the check date. This date will post to General Ledger. Comment - The default comment is the vendor name but you can change it if you wish. Check amount - Enter the amount of the check. Discount amount - See Discounts for the correct way to enter a discount on a manual check. Otherwise, leave this field blank. Gross amount - This field will populate automatically. The following image shows what the manual check looks like in the vendor detail. (M)annual, (V)oid - Type V to void a check. Bank code - Enter the bank code, such as OP or BA, as set up in the A/P Control Record that was used for this check. Check number - Enter the check number to void. 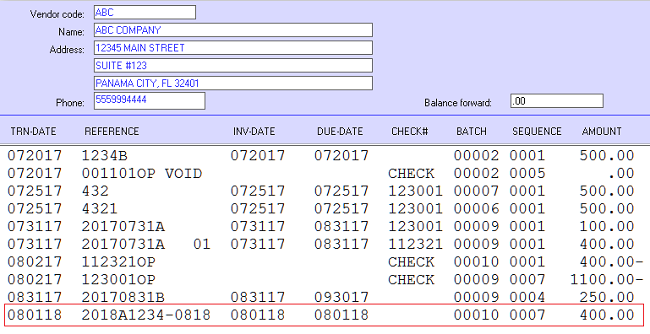 The following image shows what the check void looks like in the general ledger batch. See sequences 3 and 4. You can use the Contract Payables function to create and post recurring monthly invoices such as an auto lease or loan repayment. This program is for invoices recurring monthly only. Go to Back Office - Accounts Payable - Update and Print Contract Payables. Enter vendor type - You may select a specific vendor type such as AUT or LOA. 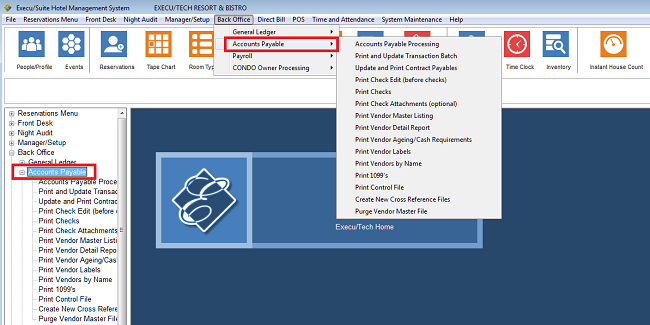 See Vendor Master Setup in A/P Setup for information about vendor types. Enter posting date - Enter the posting date such as 010118. This is the date that will apply to all contract payables invoices. CAUTION: Only run this program once per month. Update now? - Answer Y to update. Answer N to print only if you would like to review first. Continue? - If everything is correct and you wish to continue, answer Y. You will then pay the invoice just as you would pay any other invoice. Remember to update the GL Batch. 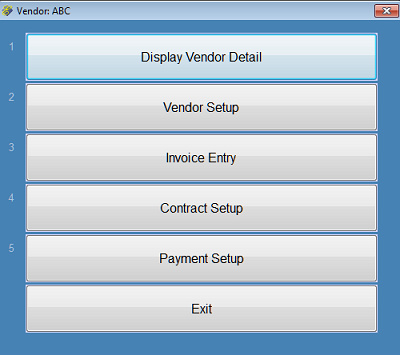 Go to Accounts Payable Processing - #5 "Display Vendor Detail". Enter the vendor code. If you do not know it, type L and press Enter or click Look-up. Look-up will prompt for all or part of the vendor name. Vendors beginning with what you entered and following will display. Select the one you wish to view. Enter the beginning date or press Enter to view all. You can display unpaid invoices only or paid & unpaid invoices plus payments. The detail will display based on your parameters. The example below shows paid & unpaid invoices plus payments. 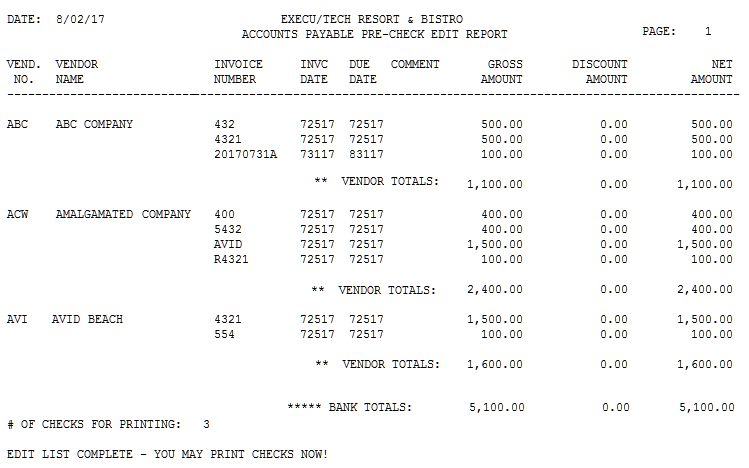 The sample below shows unpaid invoices only. Enter all or part of the vendor name you wish to look up. There are two ways to apply discounts. The first way is to apply the discount globally (for vendors assigned a discount percentage) to one designated General Ledger "Discount" account. The second way is to apply the discount per invoice to the GL account you designate within the invoice. The first method is recommended. If you process discounts other than the two ways described here, you are doing it wrong. Setup the GL account, the A/P control account, and vendor master as described in Accounts Payable Setup. You must complete the setup for discounts to work correctly. The following instructions describe the invoice entry process. When you enter the invoice, as shown below, enter the full invoice amount. Do not enter a discount. The system will populate the discount field based on your setup. Answer Y to "Discount OK?" to apply this discount. Continue with the invoice as usual. When you are ready to pay this invoice, go to Print Check Edit as usual. You will see the gross (full invoice) amount, the discount amount, and the net amount. The Net amount on the "Vendor totals" line will be the amount of the check. The following image shows what will be in the General Ledger batch. 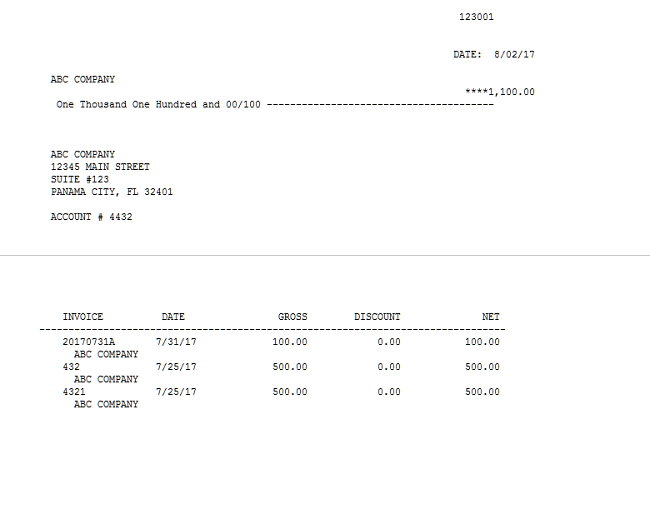 The first two lines show the invoice. The last three lines show the payment. Check amount will be the net amount after discount. This is the amount you are paying the vendor. Discount amount will be the amount of the discount. Gross amount will be the amount of the fill invoice not including the discount. See also instructions for posting manual checks. Remember, the discount will post to GL when you pay the invoice, not when you create the invoice. The only setup for method 2 is to create the GL accounts to which to apply the invoice. You will NOT enter the GL discount account in the A/P control record. You will NOT enter a discount percentage in the vendor setup. 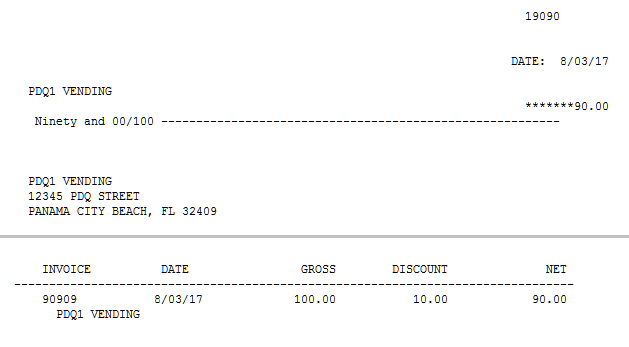 Invoice amount - Enter the discounted amount. This will be the amount that you will pay the vendor. Discount amount - Leave this field blank (0.00). Do not put the discount here. 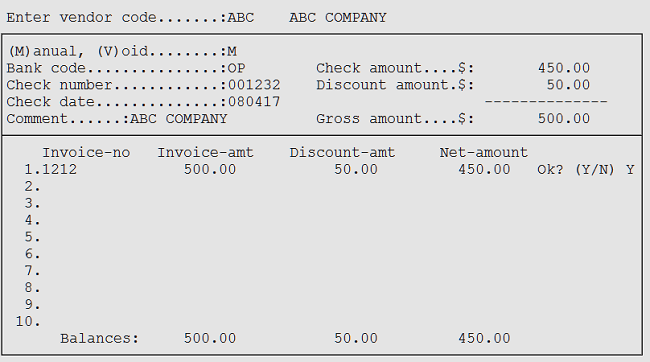 Invoice distribution - Enter the FULL amount of the invoice (before the discount has been applied). 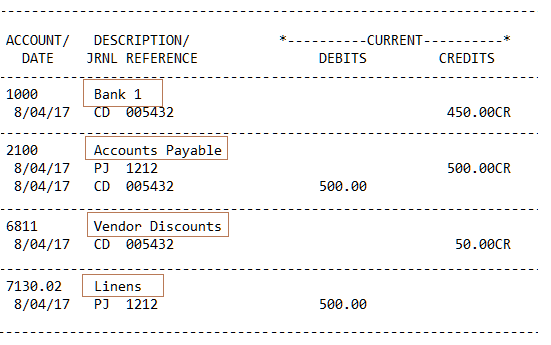 This may be one line or multiple lines, depending on how you are distributing the expenses or liabilities in GL. Then enter the DISCOUNT amount. The G/L account will be the discount amount. When entering the dollar amount of the discount, make sure to type a minus sign. When you are finished, the amount "not distributed" must be zero. Method 2 is more prone to error, particularly if you get in a hurry. Method 1 is recommended. Remember to update the batch. Do NOT delete an invoice once the batch has been updated. Otherwise, your vendor balance in Accounts Payable will not balance to the AP control account in GL. If you need to change the amount, GL Distribution, or other information, you will have to delete the invoice and re-enter it. 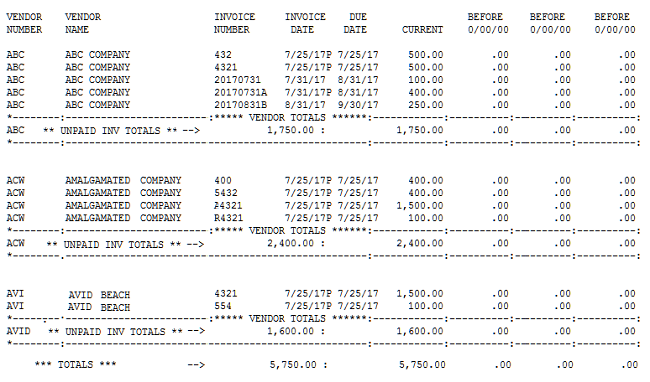 DO NOT delete an invoice that has already updated to GL. If you are not sure, look in your current batch. If it is there, it is OK to delete it. If it is not, then see the step below. Once the invoice has already been updated to GL and you need to change the amount, GL distribution, etc., you will need to create a credit invoice to offset this one. The sum of the two invoices should be zero. See the step below. To delete an invoice that has not been updated to GL, bring up that invoice. At the first prompt, press Enter to get to the bottom of the screen. Press Enter again to bring up additional prompts. Then type D and press Enter to delete the invoice. A popup will ask if you are sure you want to delete the invoice. If an invoice has been updated to GL then you need to create a credit or offset invoice. When creating the new invoice, you can append the original invoice number to make it easier to track later. For example, if you need to offset invoice 1234 you can make the new invoice 1234-A. For the amount, type a minus sign. If the original invoice was 85.95 then the new invoice will be -85.95 making sure to include the minus sign. Continue the invoice as usual. Then you need to mark the two invoices "paid" so that they do not continue to show up as unpaid invoices. As a reminder, the sum of the two invoices should be zero. 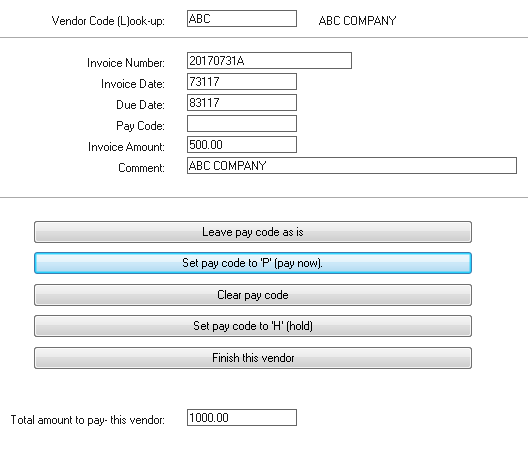 For each of the invoices (the original and the credit or offset) go to the "pay code" field and type 9 and press Enter. This will mark it as paid. Do not delete an invoice after the batch has been updated. Otherwise the vendor totals in Accounts Payable will be out of balance with the Accounts Payable sum in general ledger. Training is available for Accounts Payable and any other Execu/Tech application. We offer both remote and on-site training. Email us if you would like a quote.